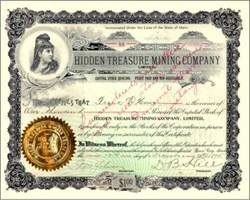 Old stock certificate from the Hidden Treasure Mining Company Limited issued in 1895. This historic document has an ornate border around it with a vignette of a women and a raised gold corporate seal. This item has the hand signatures of the Company’s President ( D. B. Hill ) and Secretary ( J. M. Johnson ). The company's offices were located in Boise City, Idaho and J. M. Johnson, Esq. lived in Mountain Home, Idaho. The certificate was issued to Frank D. Howe and endorsed by him on the verso. The company operated the Hidden Treasure and Mountain Boy Mining Claims.